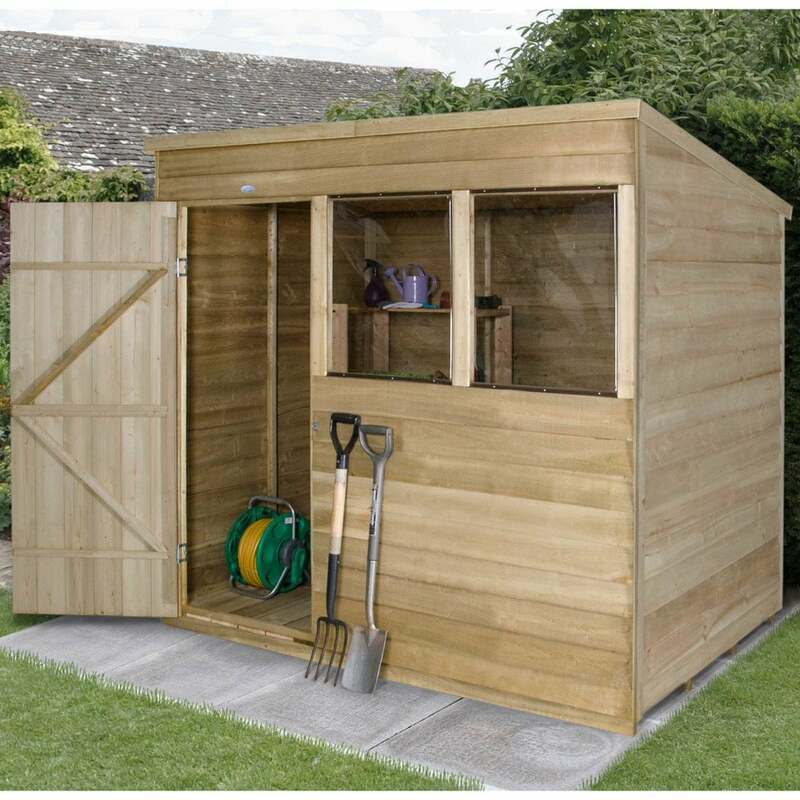 Forest Garden 7 x 5 Overlap Pressure Treated Pent Shed: This garden shed from the Forest Garden pressure treated range is guaranteed against rot and fungal decay for 15 years so that you can be sure that you are buying a long lasting storage shed. This shed has a pent design which allows for generous head room in the front of the shed and allows the rainwater to run off the back of the shed. This shed has a rough sawn finish and has overlap boards which are square to allow water to run off the sides. This shed includes shed felt to provide you with a waterproof covering to protect the shed and your belongings from the elements. This wooden shed has a single door with Z framing for added stability and hidden hinges and a hasp and staple lock to provide the contents with added security. The timber is FSC certified and has been sustainably sourced for you peace of mind and for an attractive finish there are smooth planed barge boards and finial. This shed is delivered in easy to handle sections and is simple for self-assembly with at least 2 people to carry out the build.